Translation Rates & Prices - How Much Does a Translation Cost? Translation Rates & Prices – How Much Does a Translation Cost? 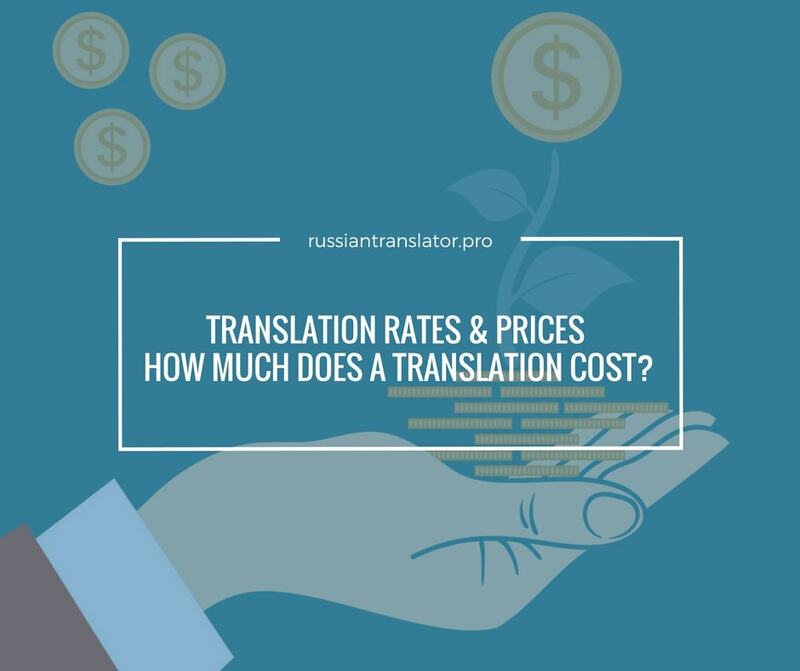 Whether you are a company or individual, if you need to translate something from one language into another the first thing you want to know is the cost of translation. The translation market is very complex and inhomogeneous. There are many factors that can influence the translation rates and prices — from the country of location and language combination to subject field and scope of work. No wonder that it is hard to find a perfect balance between the translation rate and quality if you have never hired a translator before. Therefore, in this post I have prepared a comprehensive information about translation rates and prices that will help you to get the best translation at the best price. #Translation Rates & Prices – How Much Does a Translation Cost? What influences the translation rate? Every market has its own rules, however, there is a universal law that works in almost any industry. This is the law of supply and demand. Usually, high demand (popular language combination) and high supply (a large number of translators) means lower translation rates, while high demand and low supply mean higher translation rates. But since there are many other factors in the translation industry that may cause price fluctuations, this law cannot be applied to the translation market in every possible case. To determine the translation rates and prices best fitting your particular translation project you will have to consider additional price formation factors described below. Urgency is an obvious price formation factor. The sooner you need translation to be done, the higher will be the price. However, there is an exception to this rule too. If you hire a translation agency or a team of freelancers for a large and urgent project, the agency or team may not apply the extra charge if it is possible to distribute a translation between several translators (of course provided that such distribution is reasonable and time frames are realistic). If the translation is not urgent, you may count on better pricing (depending on agency’s or freelancers’ team policy). Translation of technical or legal texts (design documentation or international treaty) is not the same as translation of the text for a travel blog. Translation of industry-specific texts requires special skills and knowledge, therefore you should take into account that translation of general subject text will cost less than a translation of industry-specific texts, like legal, medical, technical and others. Some agencies apply discounts for large volumes and ongoing translation projects. If you have a large translation project (usually more than 100 pages) you may get a volume discount from your service provider. However, you should take into account that not all freelance translators offer this type of discounts. Depending on the target audience translated text can be subject to different processing stages. For instance, if you need a translation of in-house documents or correspondence that do not require top level of quality and accuracy (since they serve to convey simple orders) translation rate for such tasks can be significantly lower, especially if you use a loyal translation service provider on an ongoing basis. In this case, translation only is enough to get the required results. But if you need to translate a scientific article for publication in a foreign scientific magazine, translation rates will be higher than in the previous case as this type of translation requires additional quality control, adaptation to the need of a specific audience, review of style, terminology and tone of voice, not to mention special requirements to formatting. In this case, the entire translation process may involve several people (translator, industry expert, proofreader, technical editor, copy editor, DTP specialist, etc.). All that consequently results in higher translation prices. Today we have tons of different file formats. Most of us use MS word, Excel of PowerPoint for everyday needs. However, there are many other file formats used in various industries. For instance, engineers use AutoCAD software to prepare drawings, designers use CorelDraw, Photoshop, and other tools to develop their concepts. These software tools save documents in different file formats, therefore you should find a translator who is familiar with that software and can work with certain formats. In some cases, this may cause additional charges. Another example, when extra charge can be applied, includes PDF files or OCRed handwriting. In this case, translation service providers have to process and prepare documents for translation or provide DTP service after translation. Translation Rates & Prices – How much is enough? Because of the large variety of price formation factors, it is hard to say what translation prices and rates can be considered universally adequate for random projects. Slator.com shared information about rates charged by the US translation agencies with the average America’s translation rate as of April 2016 being USD 0.21 per word. Of course, the rates will vary depending on the above-mentioned factors. Moreover, actual translation rates charged by translation companies will be higher than rates charged by freelance translators since companies usually have larger overheads. Now you can consider your translation project taking into account all major factors that have an influence on translation rates. In addition, you will be able to understand if the company offers undercut, fair or excessive translation prices. In case if you need professional English-Russian translation for your document, website or application, you can order my services or ask for a free quote by mail or by phone: +996 773 91 52 69. Certified Russian Translation Services. State registration Certificate #NS 011564. Bishkek, Kyrgyzstan. Share it with your friends and colleagues! It helps us a lot to promote useful content among translators and translation clients.